There’s only one show that brings about a whole lot of fun, tons of excitement, and a bunch of incredible, celebrity guests and we’re talking about the sensational John Kerwin Kids’ Show! It’s the Tonight Show for kids and the host with the most, the remarkable John Kerwin never fails at brightening up everyone’s day with his brilliant show. John Kerwin’s great charm and fantastic flair for interviewing makes the show so enjoyable for kids in the live audience and at home as well as families to watch together. Whether it’s spinning a wheel to win some awesome prizes, being in a room full of balloons and excellent floaties, or getting a pie thrown in your face – it all happens at the exceptional John Kerwin Kids’ Show. The John Kerwin Kids’ Show is all the rave and rightfully so. It has even been featured in magazines including J-14 and Girls’ World. The show features so many terrific, celebrity guests from some of our favorite Nickelodeon and Disney shows and it even gives fans the opportunity to get up close and personal and meet their favorite stars. The John Kerwin Kids’ Show is definitely a happy place for kids and their parents and the show creates such a marvelous atmosphere for all attendees. There is some special kind of feeling everyone gets whenever they watch the John Kerwin Kids’ Show and it’s definitely a feeling of pure joy. 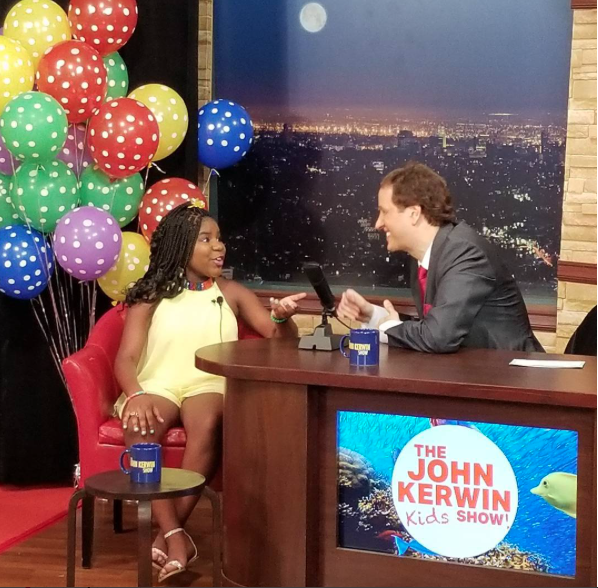 On July 11th, a magnificent taping of a brand new and phenomenal episode of the John Kerwin Kids’ Show took place and it certainly was one outstanding day! Celebrity guests Riele Downs, Trinitee Stokes, Tiffany Alvord, and Clara Lukasiak all had an amazing time appearing on the extraordinary show and joining in on all of the fun. The lovely ladies had an excellent time talking all about their fabulous projects and taking on some activities with John Kerwin. The best part of it all was that Riele, Trinitee, Tiffany and Clara got to meet all of their fans at the show and there were tons of smiles, hugs, and cute photos going around the studio set. In addition, in every episode of the John Kerwin Kids’ Show, an admirable kid is featured for his / her awe-inspiring work – whether it is in science, humanitarianism, or the arts. This episode’s “Kerwin Kid of the Month” is the fantastic, Jack Witherspoon, who is a talented chef, author and philanthropist. From the “Kerwin Kid of the Month” to all of the celebrity guests, it’s always so great to see these wonderful kids going after their dreams and inspiring others to do the same. The John Kerwin Kids’ Show always promises an unforgettable and spectacular day. I, Alexisjoyvipaccess had a blast covering and attending the John Kerwin Kids’ Show again! I always have the greatest time at all of John Kerwin’s stellar tapings for his superb show. Check out some VIPAccessEXCLUSIVE photos from my coverage of the show below and stay tuned on YouTube.com/alexisjoyvipaccess for interviews with John Kerwin, Riele Downs, Trinitee Stokes, Tiffany Alvord, and Clara Lukasiak! Previous Article: Check Out The Second Wave Of Nominees At The 2017 Teen Choice Awards And Vote For Your Faves Now! Next VIPAccessEXCLUSIVE: Prolific Carolyn Hennesy Talks About Nutrient Body Sculpt, Her Emmy Win, And More – Read Our Interview Here!